This portal is manually maintained by Bermicourt and Nick Moyes. Please contact these user(s) when you plan to make significant changes. Overdeepening is a characteristic of basins and valleys eroded by glaciers. An overdeepened valley profile is often eroded to depths which are hundreds of metres below the deepest continuous line (the thalweg) along a valley or watercourse. This phenomenon is observed under modern day glaciers, in salt-water fjords and fresh-water lakes remaining after glaciers melt, as well as in tunnel valleys which are partially or totally filled with sediment. When the channel produced by a glacier is filled with debris, the subsurface geomorphic structure is found to be erosionally cut into bedrock and subsequently filled by sediments. These overdeepened cuts into bedrock structures can reach a depth of several hundred metres below the valley floor. 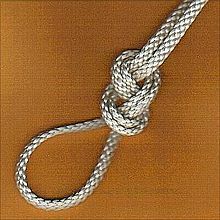 A figure-eight loop (also figure-eight on a bight, figure-eight follow-through, Flemish loop, or Flemish eight) is a type of knot created by a loop on the bight. It is used in climbing and caving where rope strains are light to moderate and for decorative purposes. The knot is commonly followed by tying a strangle knot (a.k.a. half a double fisherman's knot) or an overhand knot around the standing end. Montes Apenninus on the Moon was formed by an impact event. This 1848 "Scetch showing the actual elevation of the Snow Line in different Latitudes" by Alexander Keith Johnston shows the snow lines of mountains in America, Europe and Asia. Stretcher box in Cumbria, England, prepositioned equipment saves mountain rescue teams having to trudge up mountains with it. Mountain rescue team members and other services attend to a casualty in Freiburg Germany. A mountain rescue team in Iran moving a casualty. Do you have a question about Mountains that you can't find the answer to? Consider asking it at the Gpedia reference desk. For editor resources and to collaborate with other editors on improving Gpedia's Mountains-related articles, see WikiProject Mountains.